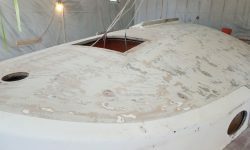 I continued with another round of sanding on the deck areas as needed. 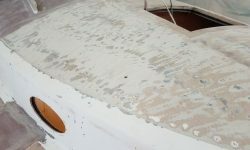 The coachroof would require a fair bit of work going forward, as the existing repairs, while apparently sound, were far from cosmetically acceptable. 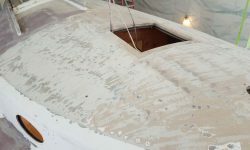 As a first step, I had to get rid of the remnants of the old adhesive that had secured the Treadmaster. 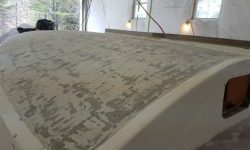 In this case, since the existing surface was such a mess and wasn’t remotely fair to begin with, I used a sanding disc on a grinder to quickly remove the worse of the old adhesive and aggressive nonskid paint on the coachroof, taking care not to go too far and leaving behind a skim of paint that I’d remove another time with a less-aggressive tool. 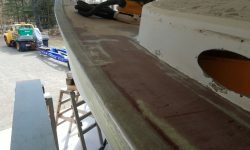 My next main focus was the hull-deck joint. 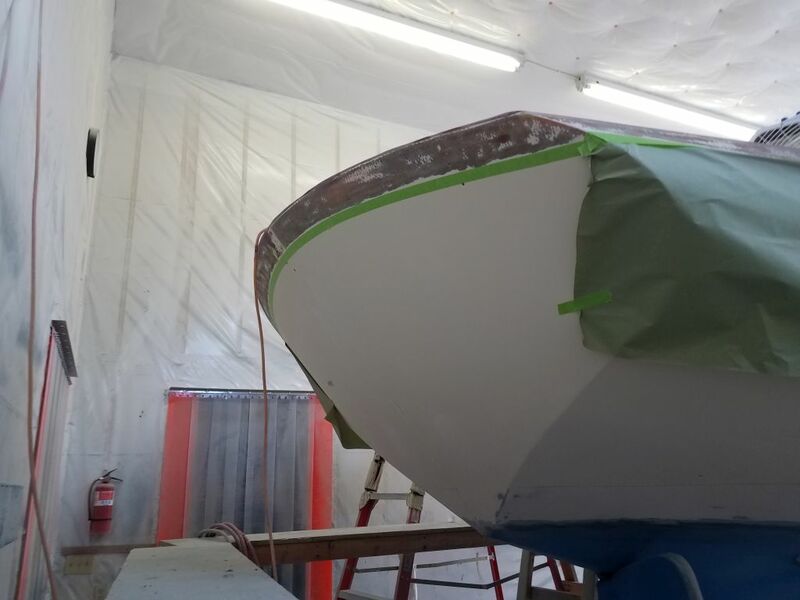 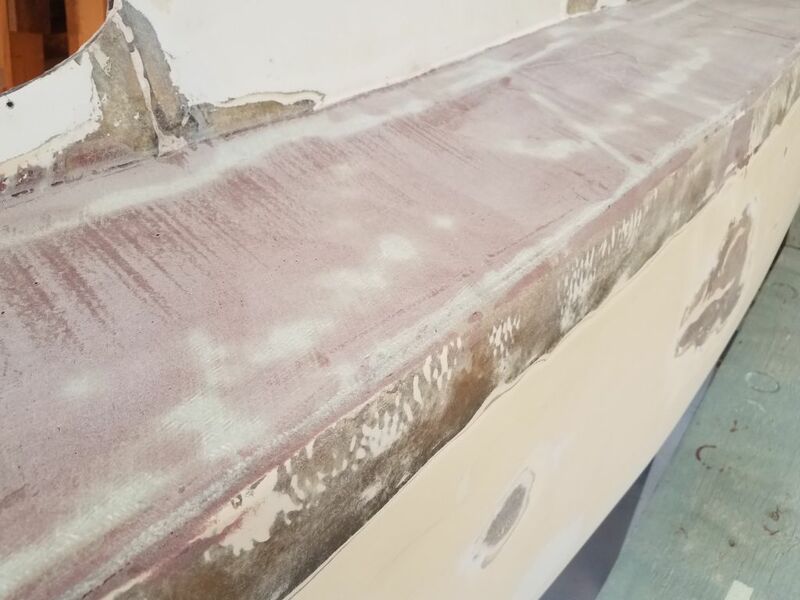 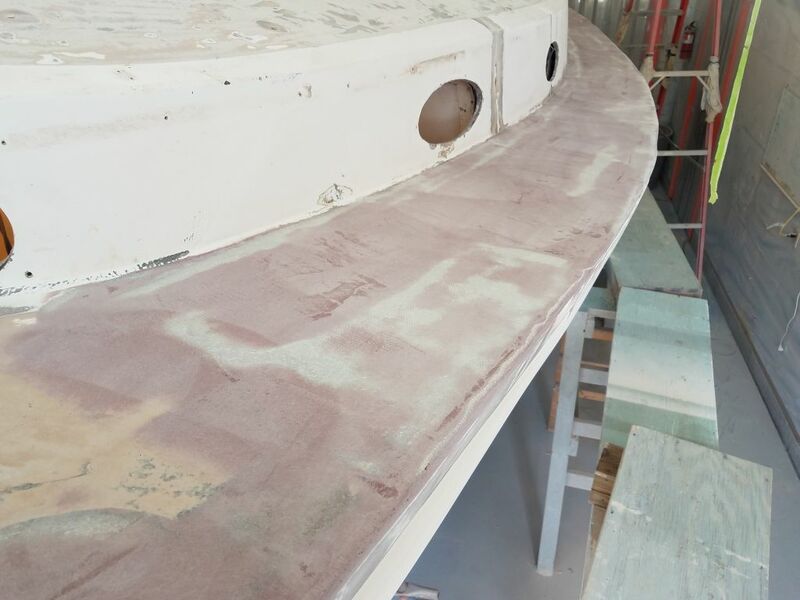 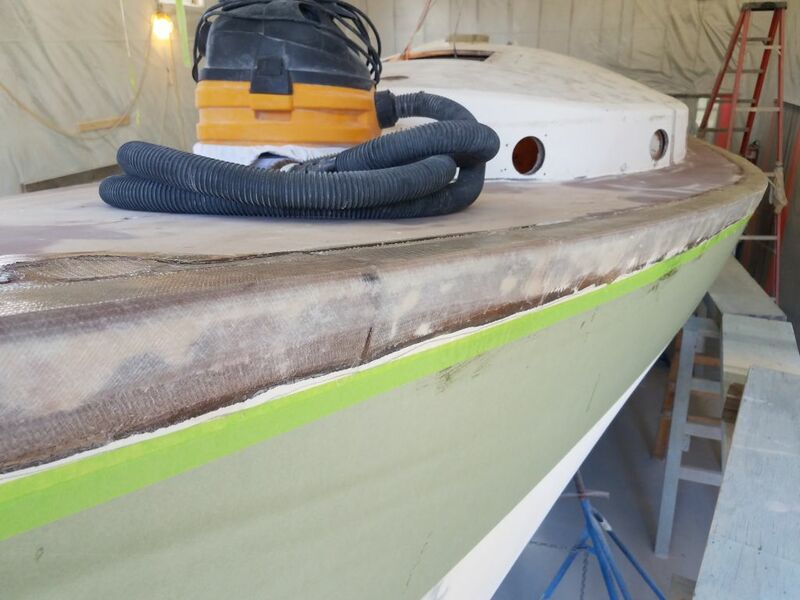 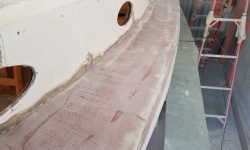 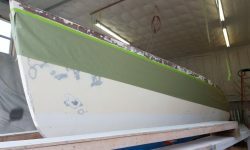 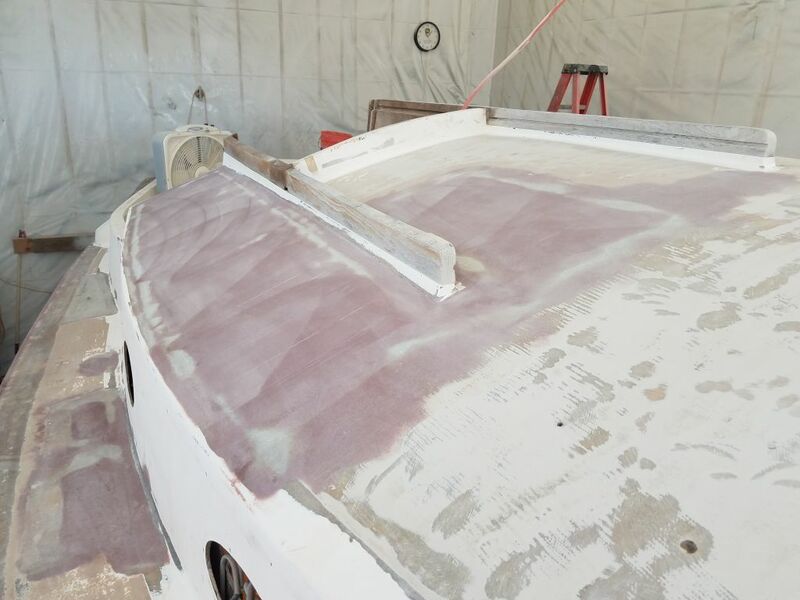 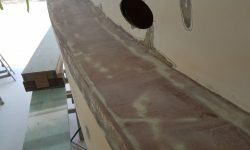 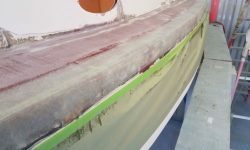 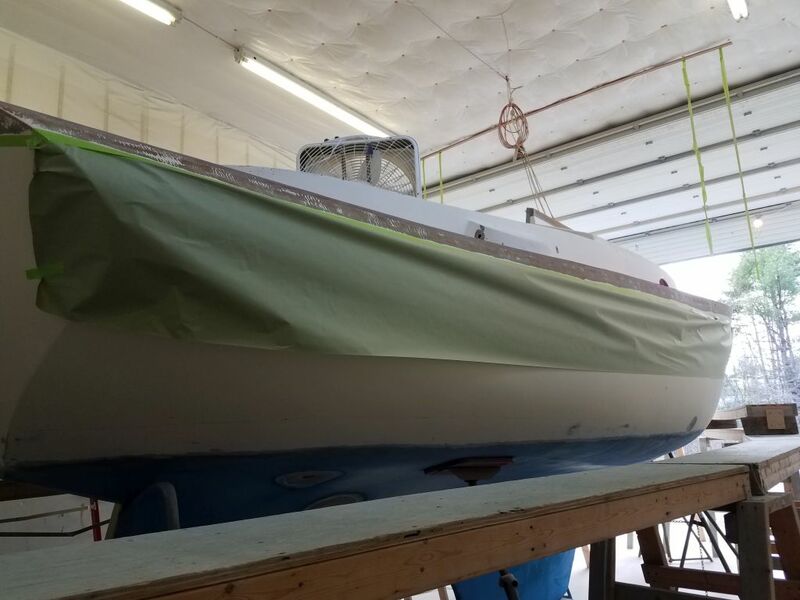 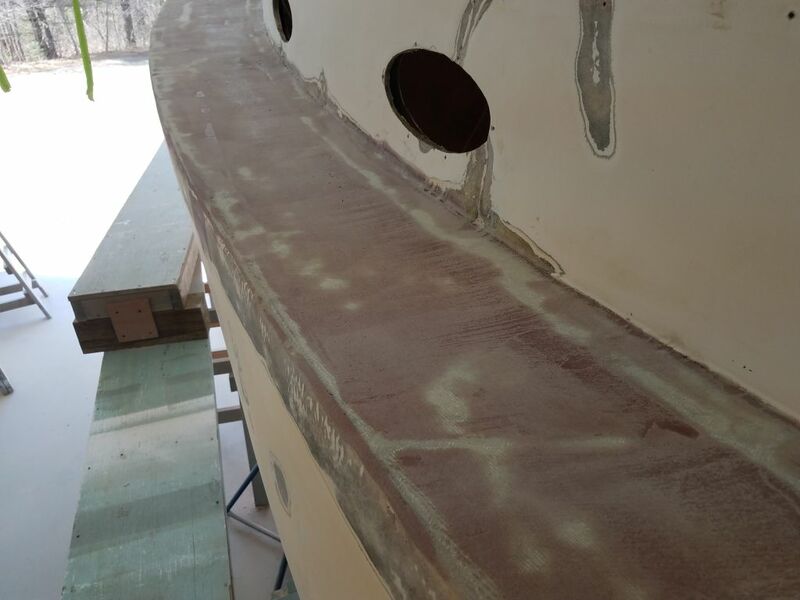 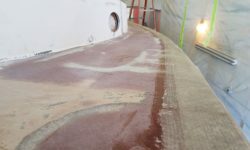 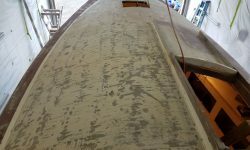 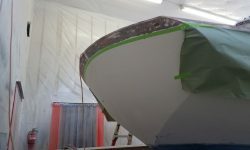 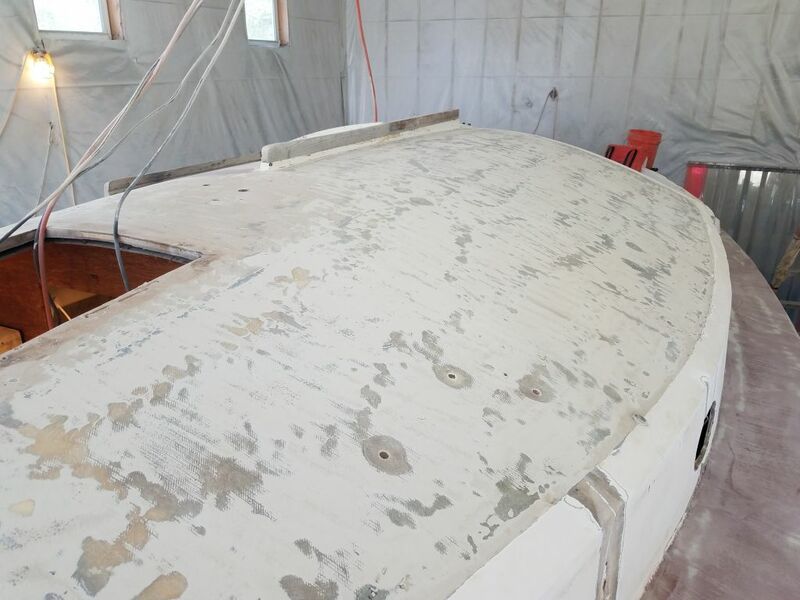 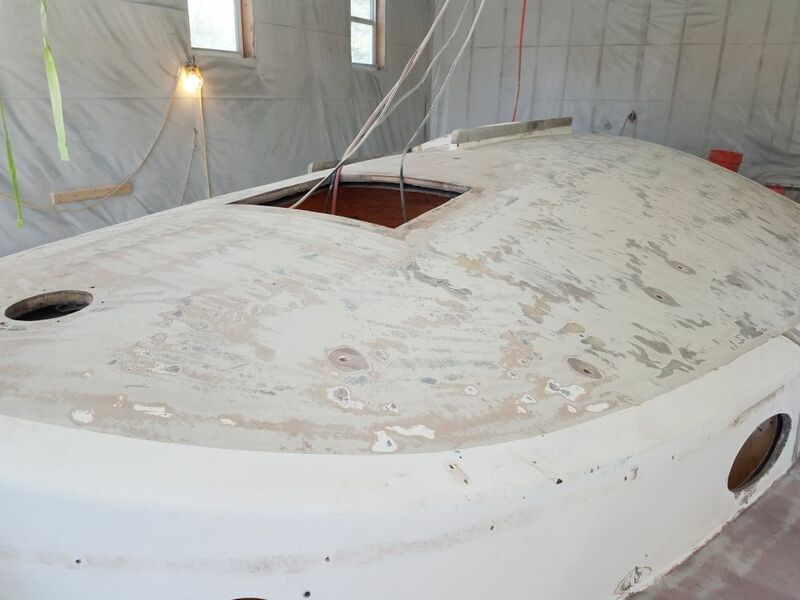 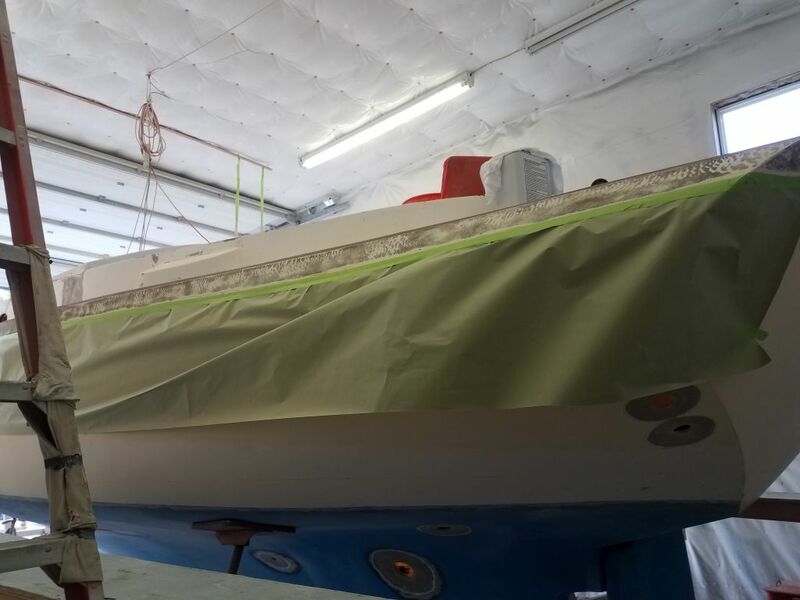 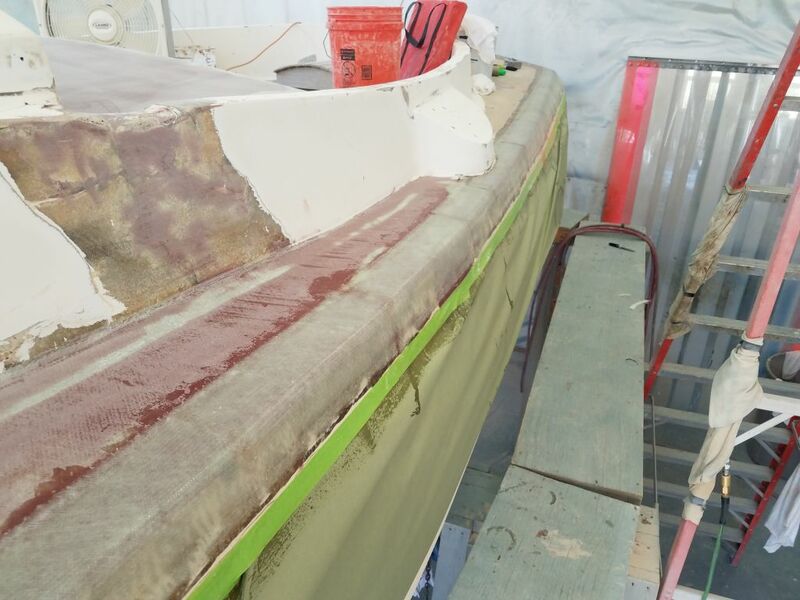 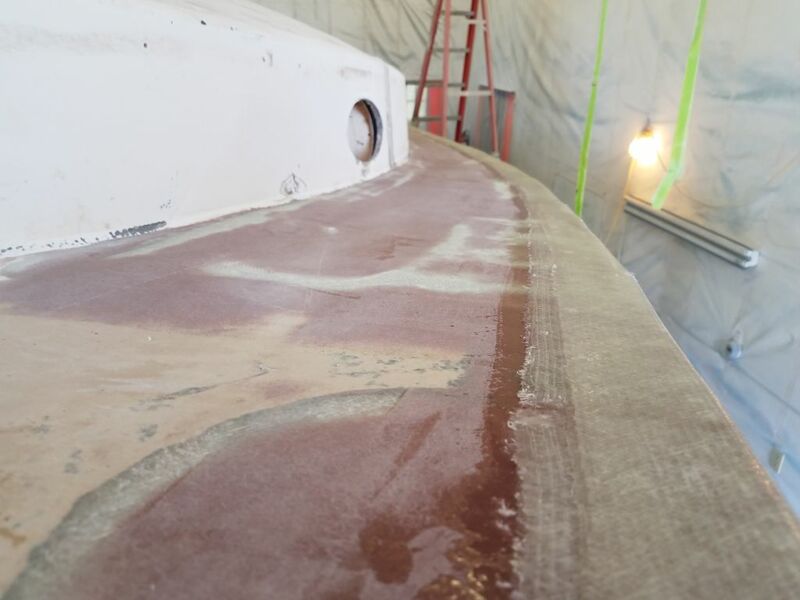 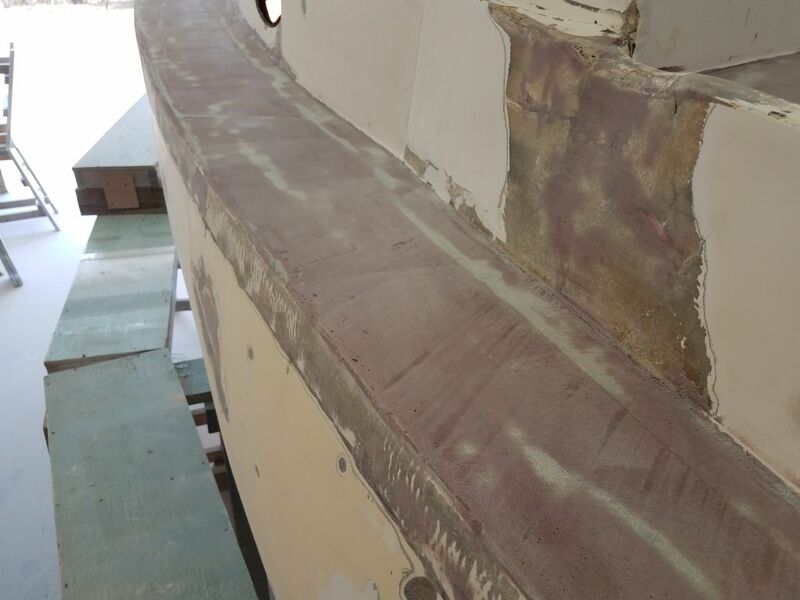 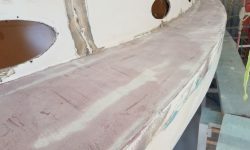 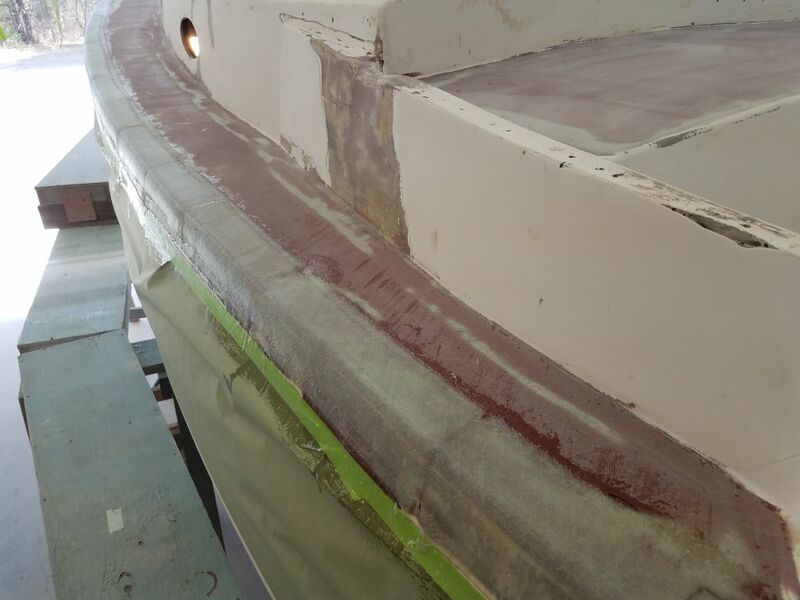 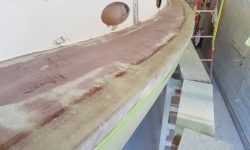 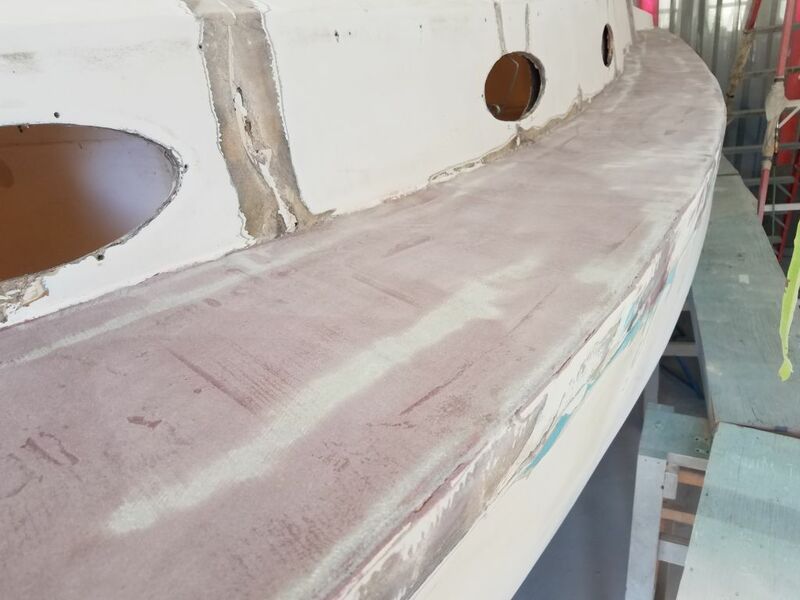 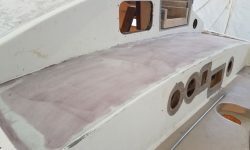 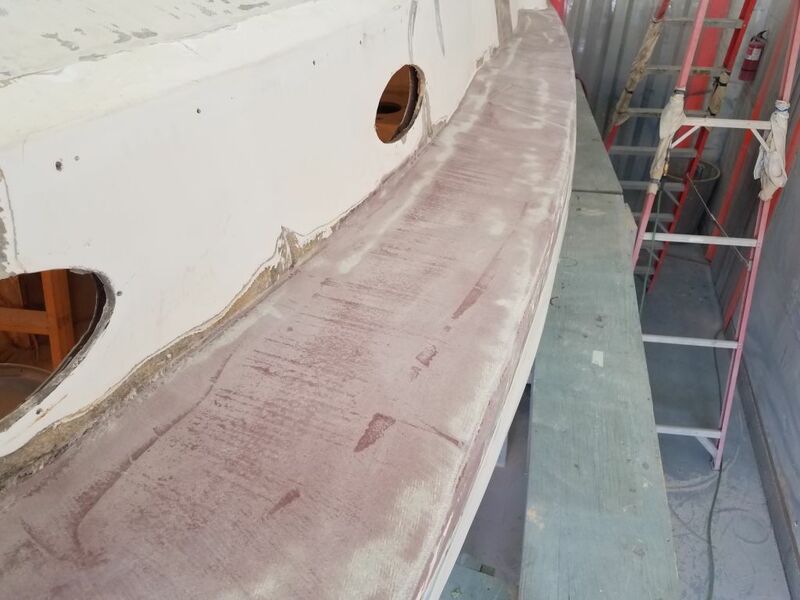 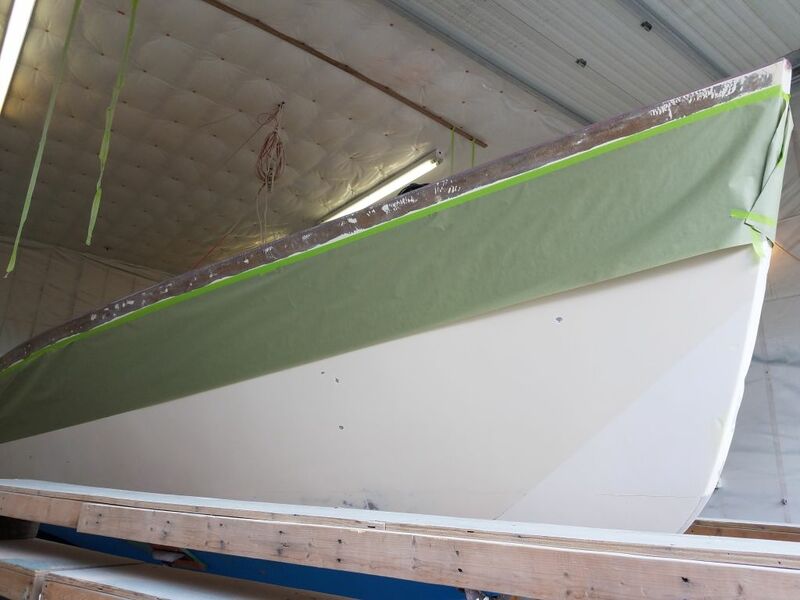 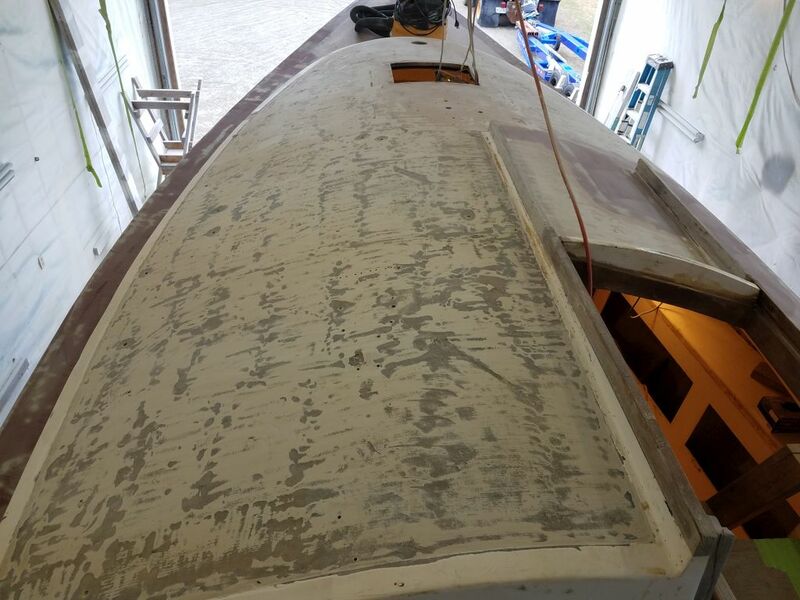 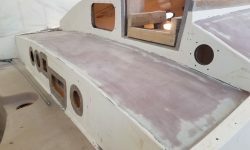 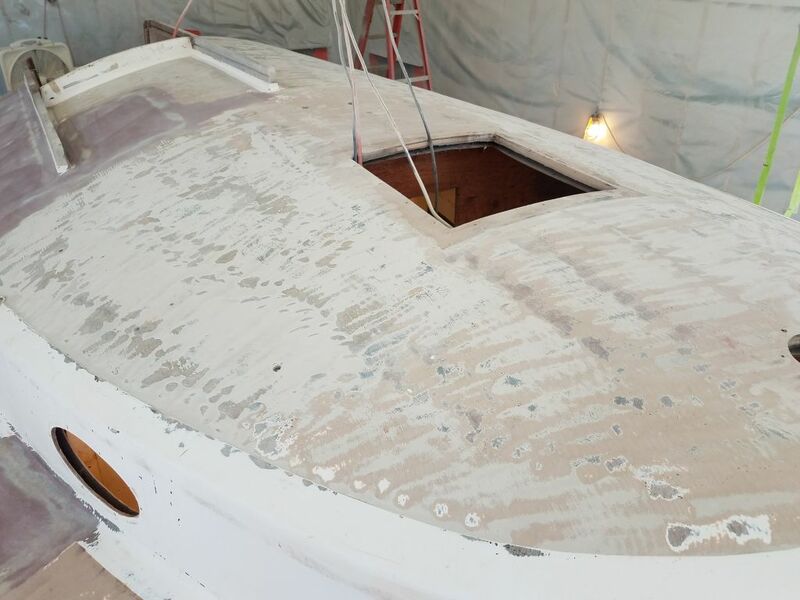 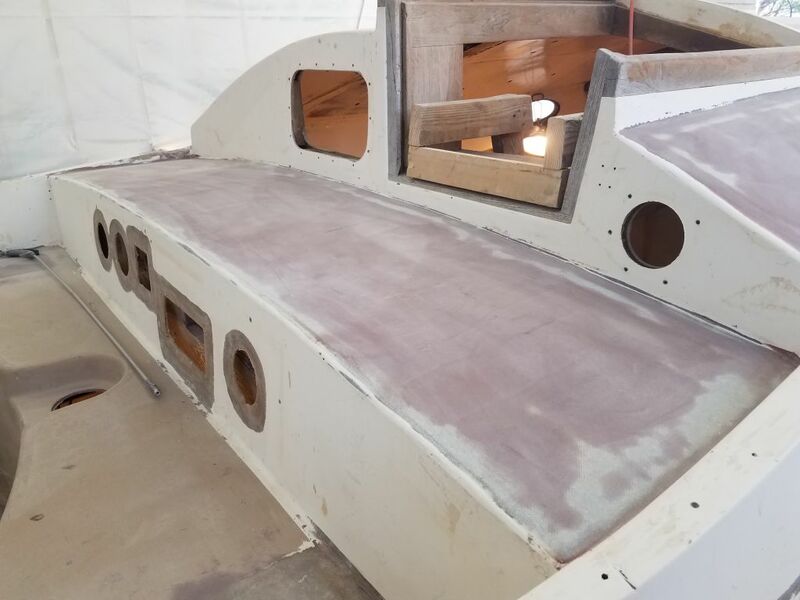 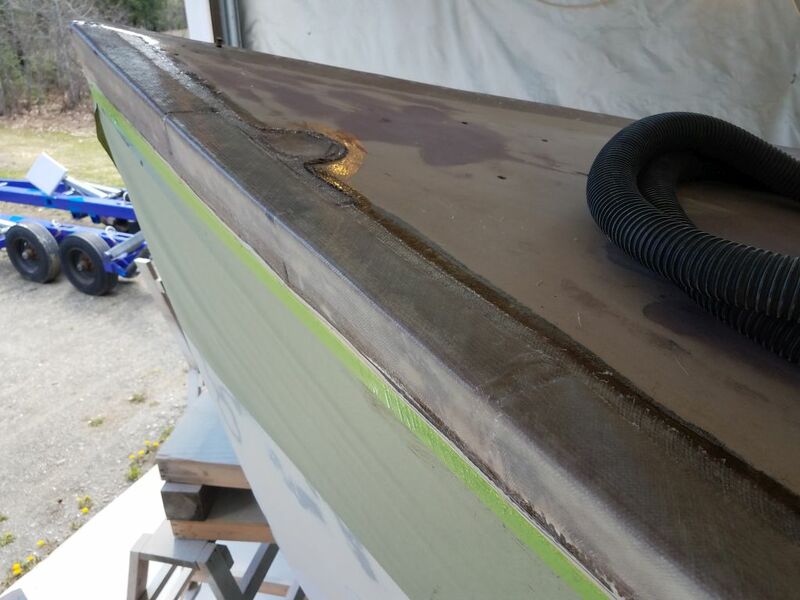 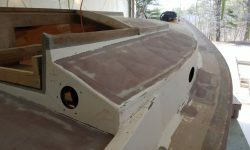 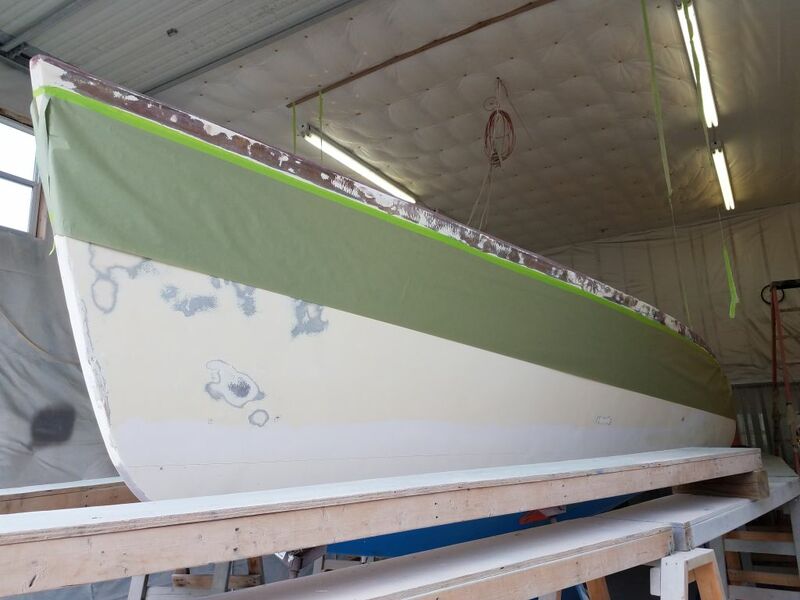 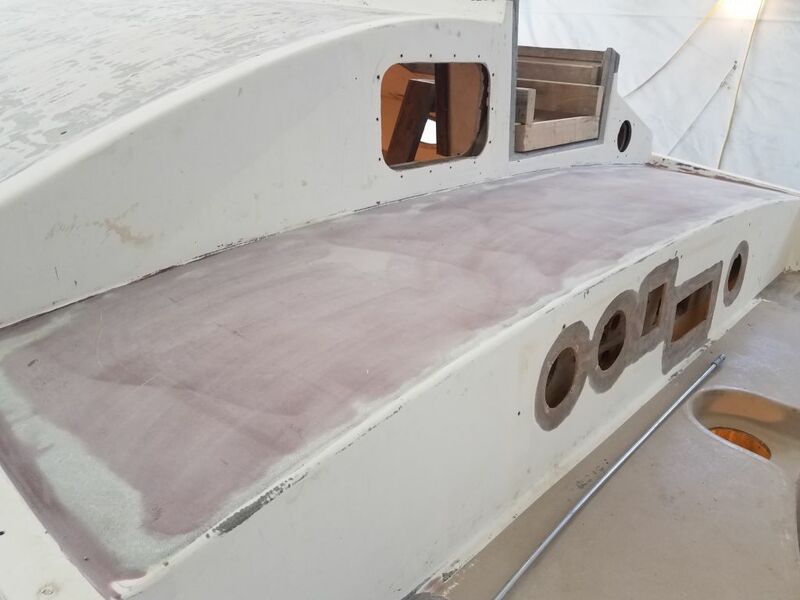 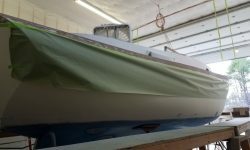 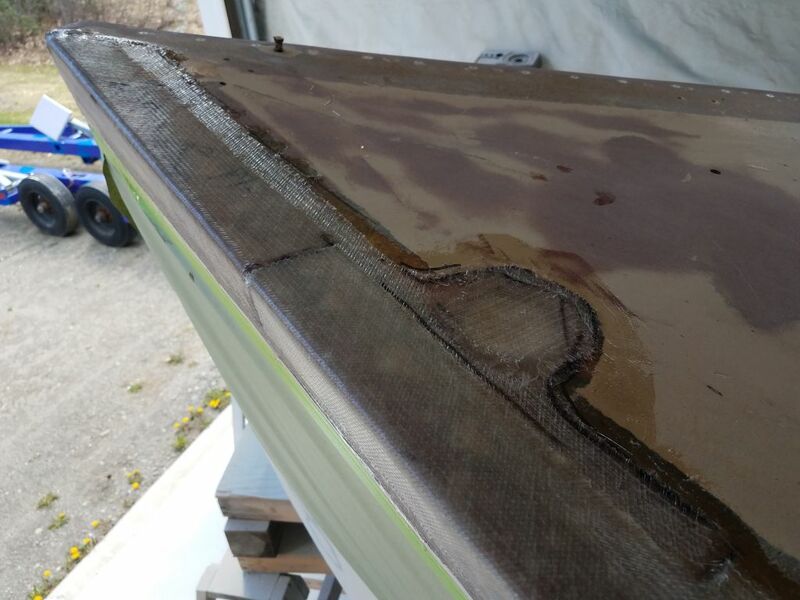 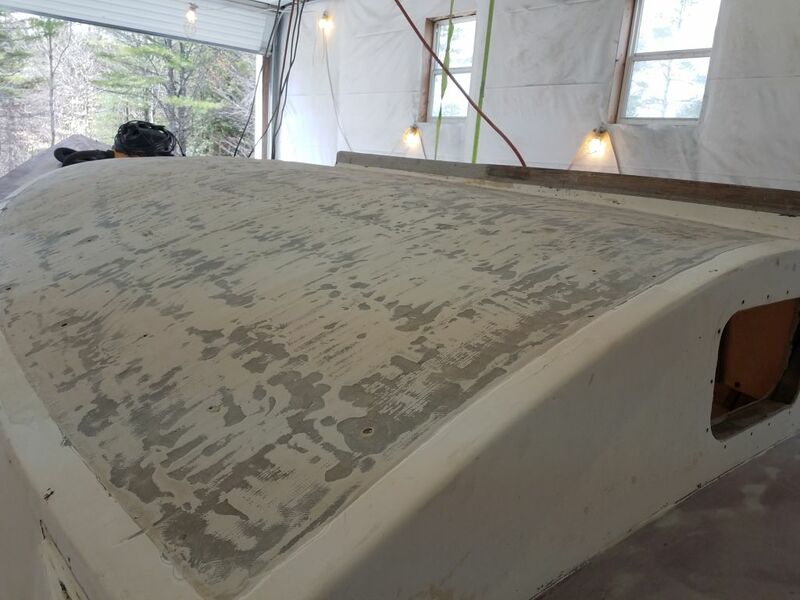 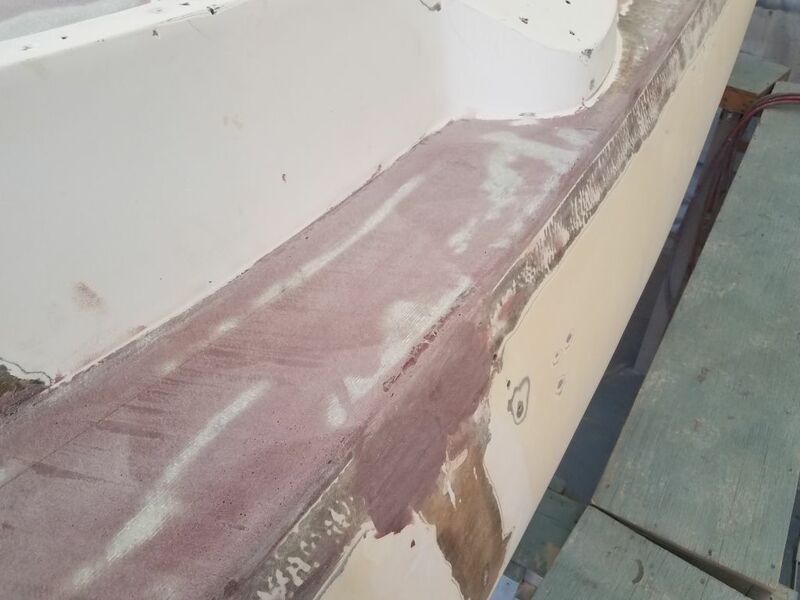 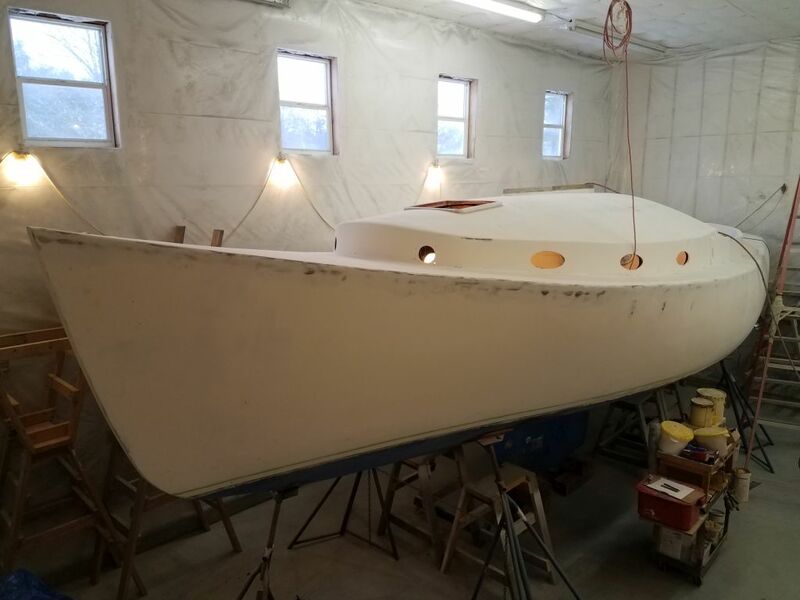 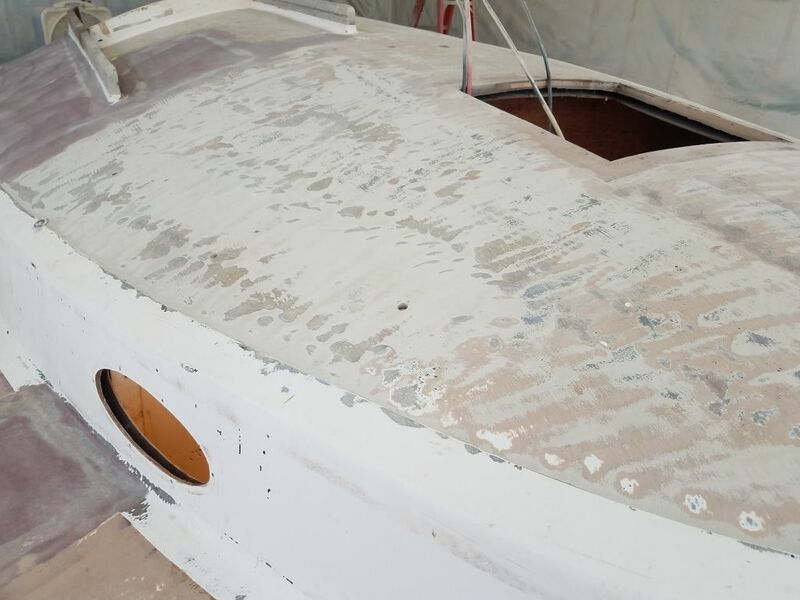 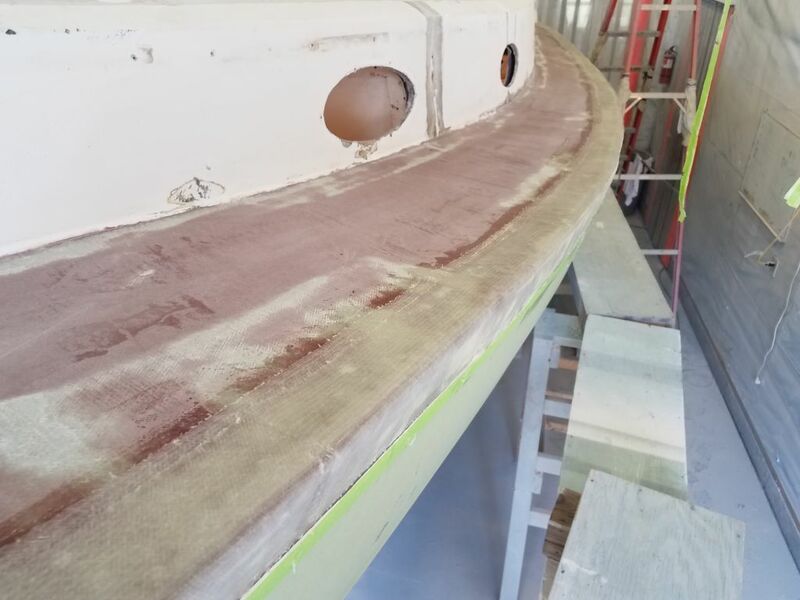 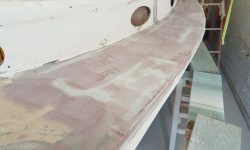 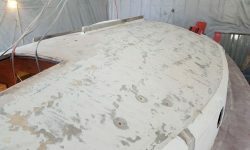 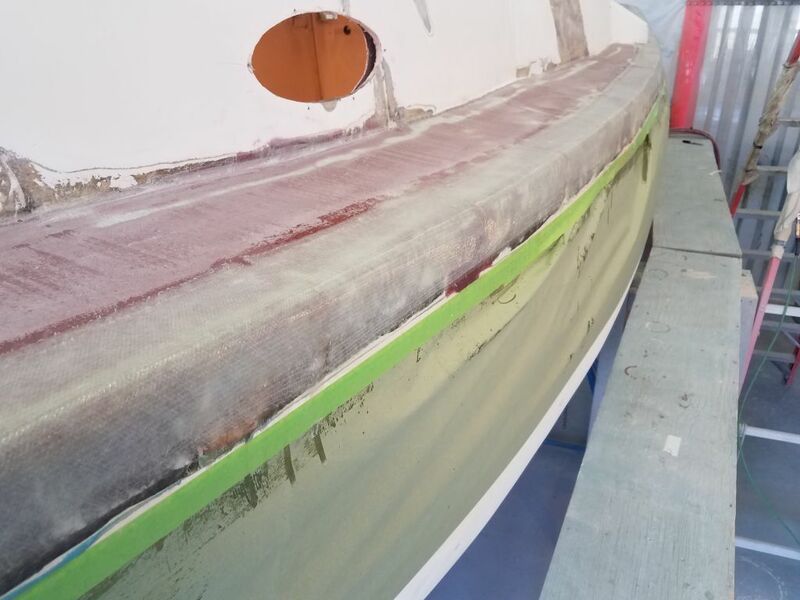 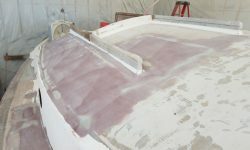 Now that the port sidedeck was rebuilt, and the first round of fairing applied that had brought the edge to similar contours as the remaining portion of the deck, it was time to get to the fiberglassing. 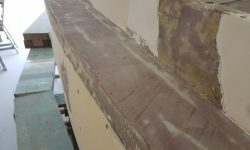 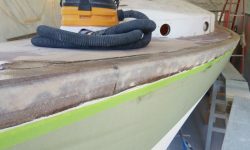 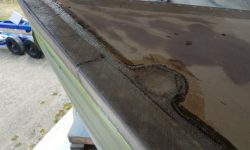 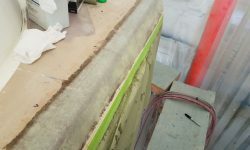 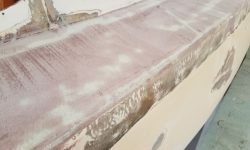 To prepare, I masked off below the edge of the area I’d prepared on the hull to catch the inevitable drips of resin during the installation, and pre-cut a series of 24″ lengths of 6″ and 4″ biaxial tabbing that I’d use to glass over the joint. 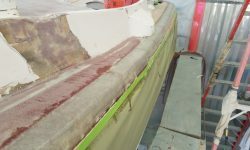 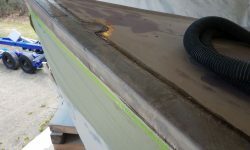 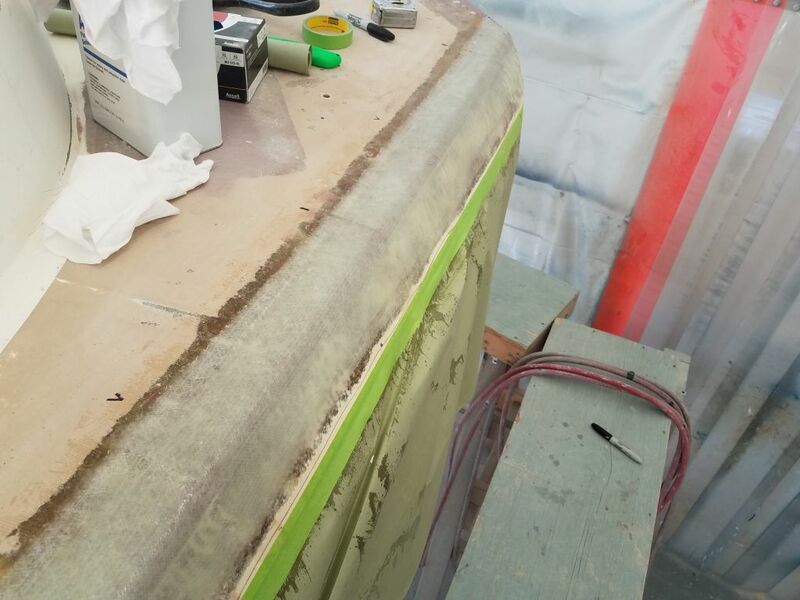 I spent the remainder of the day installing the two layers of fiberglass over the port gunwale, starting at the bow with a couple special pieces that I cut to incorporate a hole repair over the old anchor hawse located near the rail. 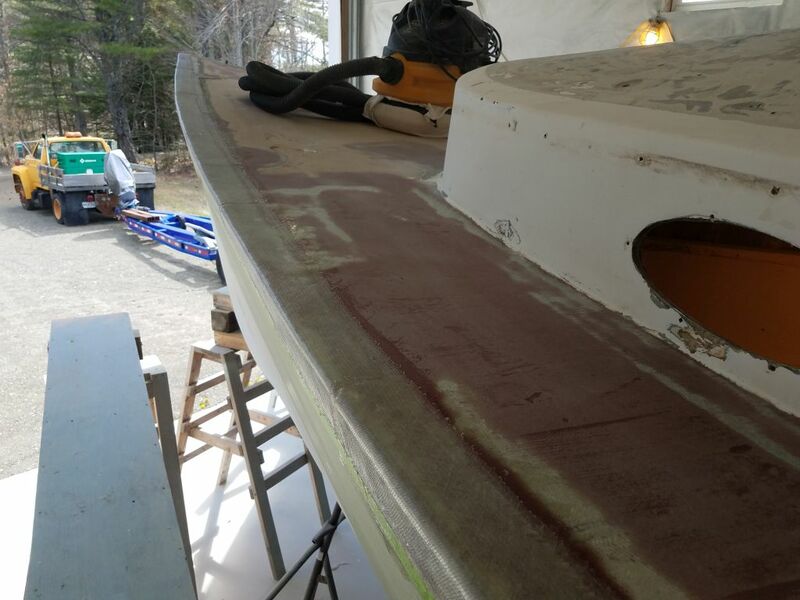 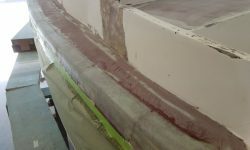 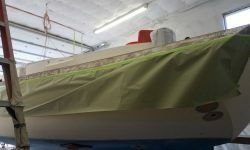 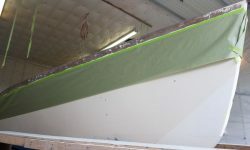 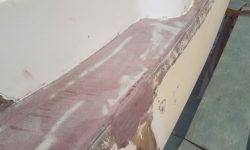 I staggered the seams between the two layers by 12″, and, installing two sections at a time, worked my way aft to the transom by the end of the day. 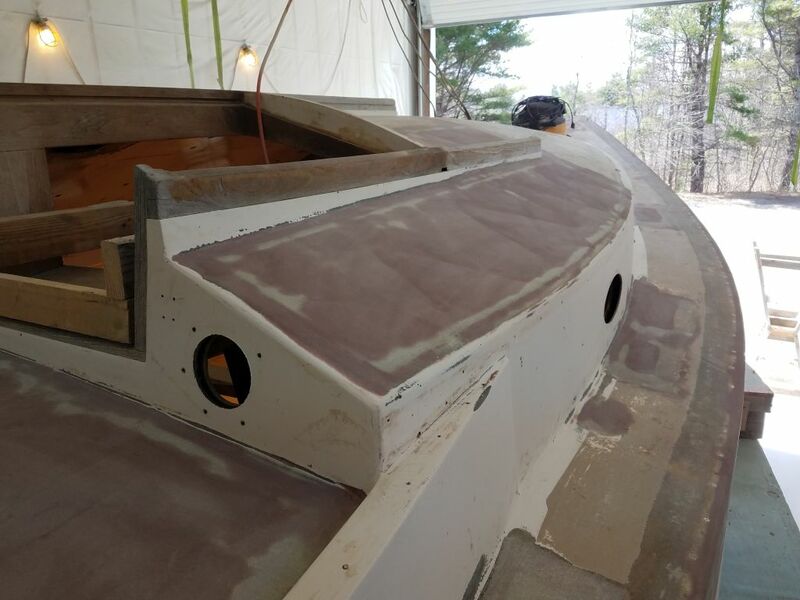 To finish up, I pre-cut a couple special pieces for the starboard side, mainly to fit around the winch island, which would save time in the morning when I wanted to repeat the glassing process on the other side.